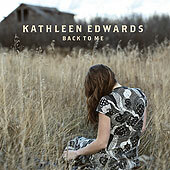 Back to Me is the second studio album by Canadian singer-songwriter Kathleen Edwards. It was released March 1, 2005 on the independent labels MapleMusic in Canada and Zoë Records in the United States. The album reached #176 on the Billboard 200 and #6 on the Top Heatseekers chart. This page was last edited on 31 October 2018, at 12:28 (UTC).